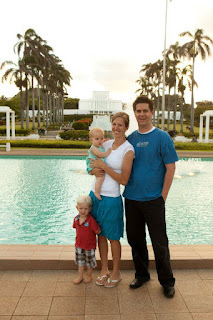 We had such a wonderful time in Hawaii with our best friends/cousins Eric & Nakita May 25-June 2. We were visiting Seth & Amy who have recently moved there for 6 months and are now quite the locals. Hawaiians (by birth or simply location) are so generous and giving. We felt so blessed and loved while there. I have to say that my favorite part of the vacation was being with Seth & Amy and watching Kaylyn being smothered with love and attention by her four cousins. I suppose we could do that in any state, but everything is extra wonderful in Hawaii. Kaylyn LOVED playing in the sand. It's so cool to watch her discover and experience new things. Kaylyn has the most fun with her daddy! Eric and Nakita got the troops to build a sweet sand castle. Sam found a crap to go on top of it! We all piled into Seth & Amy's minivan to go watch the sunset at Pipeline - a recent Christensen family tradition. Notice Sam, Ellie, and Jayne in the very very back where the boogie boards and bags usually ride. Kaylyn LOVES Jake. She made this high pitched squealing sound and all of her limbs went into motion whenever he was around. She always got the best welcome from Jakey, "Baby Kay-yin! Baby Kay-yin come home!" Tim and Rose were also visiting Seth & Amy from Seattle. They are such wonderful people. The kids call Rose "Grandma Rose." It was easy to see why they loved them so much. Amy: We were just told there is a Hukilau at Hukilau beach this morning at 8. We're going to go watch it if you want to join us. Amy: It's a fish party:) I don't know either. It's an ancient way of catching fish. They go out into the water and clap to scare the fish into their nets. For official info see http://en.wikipedia.org/wiki/Hukilau. We stayed in a really cool house in Hauula that Micah found for a great deal (of course!). He also found this housemate in the bathroom one evening. Luckily the rest of the stay the spider stayed in this cup. Eww!! I asked Amy if I could bathe Kaylyn at her house a couple of times during the week and she said, "Sure! As long as you don't mind if Jake joins her!" She loved having a bath buddy. She cracked up whenever he splashed her. Back left is Jakey's Hawaiian twin brother, best friend, and neighbor...Vincent. This to me looks like love at first sight. He was so sweet with Kaylyn and kept kissing her on the head. Kaylyn doing the Haka. This is one of my favorite pics! Jayne is not only a fashionista, but a salon beautician. Amy was her first victim. I was next. I'm holding cups of water for her to dip the comb in. Kaylyn even got in on it, though she doesn't have much hair to comb, Jayne didn't mind. Kaylyn was so happy in the water. 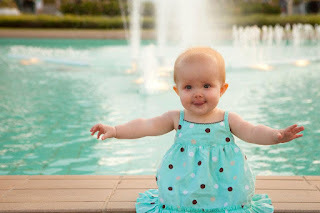 She loved splashing and kicking her feet. These are our favorite howlies on the island. Kaylyn chewed on this pineapple the whole time we were at the Dole Pineapple Plantation. Uncle Eric buried her in the sand. She was quite interested. I'm not sure if she knows that those are her toes or not. This is one of Kaylyn's favorite things. I love this picture of Nakita. She's so pretty! Hiking Maunawili Falls, well, sort of. Micah and I were deep in conversation as we started the hike so we actually missed the turn off on the trail to go to the falls. After almost 2 hours of hiking we decided to cut through the jungle to walk on the golf course back to our car. It was much easier walking. What a beautiful trail! We're glad that Eric & Nakita got to the falls and we weren't leading the way! Morning nap. She's holding my arm, so sweet. Canoe ride at the PCC. Eric the Canadian drummer on the island of Tonga. My nephew Sam is a seriously good fire knife dancer. He's only 11. Watch out world. He made fast friends with Josiah at the PCC. Josiah's uncle is Sam's fire knife teacher AND the world fire knife champion. He's also Vincent's dad. We hiked into another waterfall and this time we found it! Kaylyn slept peacefully by the pond as we grabbed the rope swing. Though the actual waterfall was dry, we each took a turn swinging on the rope into the pool. Back in the carrier that Amy's neighbor let us borrow. So happy. So asleep. She sleeps with her eyes open. Amy & Seth's neighbor David got work off one night to take Eric and Micah spear fishing. Scary! They speared an octopus, lobster, and unicorn fish. I think that Eric was especially in heaven. He is the king of exciting adventures! Eric & Nakita jumping off the rock. Micah got some great shots! Rachel jumping off the rock. Eric & Nakita at Food Fest on BYU-Hawaii campus. Kaylyn loves her cousins so much. They took such good care of her making her beds, sharing toys, wanting to feed her everything they had, and giving her lots of kisses. Ellie is so much fun! She's a behind the scenes kind of girl not needing to be in the spotlight, but is a great observer and always knows what's going on. She has a great little sense of humor too and can be very witty. I could hang out with Ellie all day long. By the end of the trip Kaylyn was really getting those hula arms down. We had such a wonderful trip. We were so grateful that we got to be there with Eric and Nakita when Seth, Amy, and kids got to speak and sing in sacrament meeting; Gary Crittenden gave the BYU-Hawaii Devotional; Micah got to be a guest speaker in Seth's entrepreneur class; and Seth spoke in the Entrepreneur Lecture Series. Seth and Amy are not only some of the funnest people on the planet, but they are amazing examples of faith, strength, and they do things the right way by putting the Lord and their family first. We love them so much and can't wait for them to be in Utah...or maybe we should all just pack up and move to Hawaii with them! Looks like such a perfect trip Rach. Don't you just miss it?! Kaylyn is so adorable, gets cuter by the minute. Love that you missed the trail for Muanawili Falls, haha. Makes me laugh. And love all the pics of you and baby girl and her with her dad. Some great parents she has. Lucky kid! And btw, you look terrific!! Hopefully see you guys soon. Ah! I wanna go back after reading through all these fun memories. I need to give you a bunch of pics from my camera, and maybe you can do a second post :) Thanks for being such fun and easy going travel partners! We love you guys!! !